Home » Technology » What Is AeroVironment and Should I Invest in Its Stock? You can all feel it coming, right? There is this sense of foreboding in the market … like a crash may be just around the corner. Facebook’s record single-day plunge this week was a reminder that growth cannot continue unabated forever. This bull market will end, sooner or later. I’m not going to argue with you about what will spark the end of the bull market (I’ll leave that to my colleague, Ted Bauman.) The point is, you need to start preparing for the inevitable now. You can do so by diversifying your investments and moving into sectors that generally hold their value during economic downturns. Typically, that means setting aside investments in high-flying technology stocks and turning your attention toward consumer staples like Walmart and so-called “sin” stocks like alcohol and tobacco firms. Also, snapping up defense sector darlings like Boeing and Raytheon. However, the defense sector is filled with potentially high-flying technology stocks that should hold their ground remarkably well in a recessionary market. Today, I’m going to look at one such defense sector opportunity … one you likely have not heard of that’s up 62% in just the past three months. One of the biggest problems faced by military personnel is a lack of immediate battlefield intelligence. An AWACS (Airborne Warning and Control System) and satellite imaging can only provide so much information, and most of it is at a broad, regional level. What about how many hostiles are directly on the other side of that ridge? Their positions? Armaments? That’s where AeroVironment Inc. (Nasdaq: AVAV) comes in. The company manufactures unmanned aerial vehicles (UAVs), or drones. But these drones are nothing like the GoPro knockoffs your next-door neighbor annoys you with on the weekends. With names like Wasp, Puma, Raven and Snipe, AeroVironment’s drones are designed to gather mission-critical data at a moment’s notice. They can see around the next corner, get an aerial view of the next intersection or even look beyond that next ridgeline. And then there’s the AeroVironment Switchblade, which is a tactical missile system that can be guided to its target by an operator via an onboard camera. While the coolness factor of AeroVironment’s products might have gotten to me a bit, these UAVs have found a solid home in the U.S. military arsenal. That means revenue and a steadily rising bottom line for AeroVironment. In fiscal 2017, AeroVironment reported that contract services revenue increased 116.9% to just under $29 million. Total revenue for the year was up 18%. Even more impressive is that AeroVironment’s order backlog surged 148% year-over-year to a record $174.3 million. With the U.S. military increasingly relying on unmanned vehicles for both engagement and reconnaissance, AeroVironment should continue to see increased revenue for some time as a first mover in the market. The company is also moving into artificial intelligence and civilian applications for its products — like first responders and fire departments. What’s more, AeroVironment’s drones will be the first vehicles to fly on Mars, following a recently announced partnership with NASA. As I mentioned earlier, AVAV stock is slowly starting to gain a following among investors. Despite a lack of coverage by the mainstream financial media, the shares have rocketed higher since April. As you can see from the chart, AVAV stock has settled into a long-term pattern of stair stepping higher. In other words, the shares pop following an event like earnings, level off in a controlled consolidation amid profit-taking and then repeat the pattern in a few months. Right now, AVAV stock is in the consolidation phase of this pattern, providing a good entry point into the longer-term rally. Those interested in adding some portfolio protection via the defense sector but maintaining exposure to tech-sector-like growth should seriously consider buying in now. 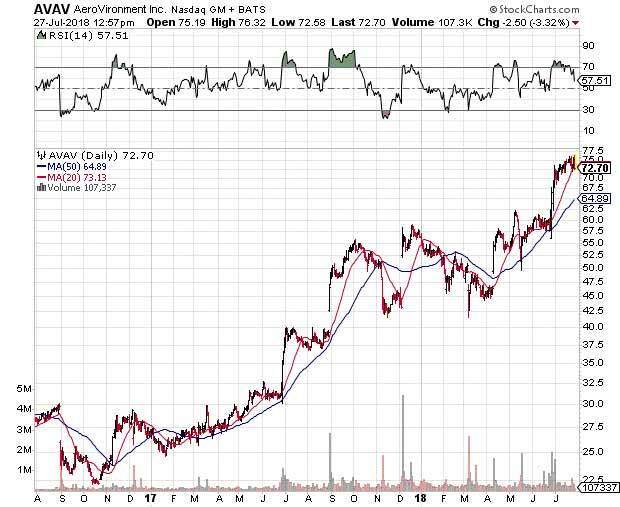 AVAV is still coming out of an overbought period, however, so some more slipping in the stock price is to be expected. As such, you may be able to get a better deal by buying any pullbacks to the $65 to $70 range.